The crocodile believed to be the culprit behind the disappearance of Sharbini’s chickens and turkey in Kampung Dagang, Marudi. 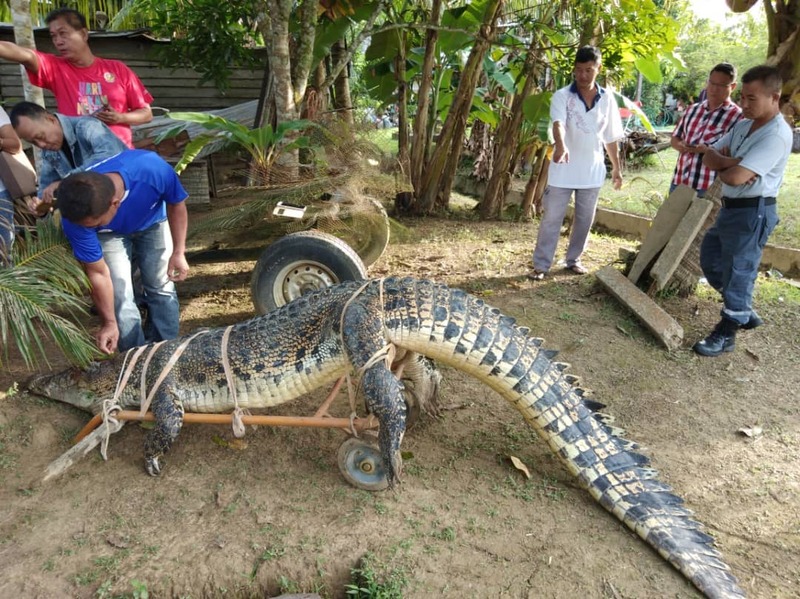 MARUDI: A 13-foot crocodile, believed to have been the culprit behind the disappearance of several chickens and a turkey in Kampung Dagang in Marudi, has finally been caught at around 5am today. The reptile, estimated to be weighing at 300kg, was captured after it took the bait set up by Sharbini Hamid, who was angered after his chickens and turkey were suspected to have been eaten by it. Sharbini said two weeks ago, his turkey went missing and he discovered footprints of a crocodile in the area. He suspected that the reptile could also have been the culprit behind his missing chickens before. “Yesterday, at around 4pm, I went to put up the trap. “This morning around 5am, I went to check on it and I was delighted that it took the bait,” Sharbini said. About 10 men were needed to bring the reptile to the riverbank.